Whenever you use Internet Explorer (IE), it tracks which Web sites you visit and which webpages you view. This is to make it easier for you revisit a webpage you viewed recently. It can also be used by some else who shares your computer to track what you have been up to. To cover your tracks, you can easily delete items from the history list. 1. In IE's toolbar, click on the [History] button to open the "History" panel. 2. Right-click on an item in the history list that you want to delete. 3. In the popup menu that appears, select "Delete". 4. In the warning message box "Are you sure you want to delete History Item:..." that appears, click on the [Yes] button. If there are dozens of links in the history list, it would be faster to delete everything from the history list. 1. In IE's toolbar, click on the "Tools" menu and select "Internet Options..." to open the Internet Options dialog box. 2. In the Internet Options dialog box, on the General tab, in the History section, click on the [Clear History] button. Of course some else who shares your computer might find it annoying that you deleted their history as well as yours. In this case you can utter something like "damn Internet viruses!". If you find it annoying that IE tracks your Internet activity at all, you can disable the history list. 2. 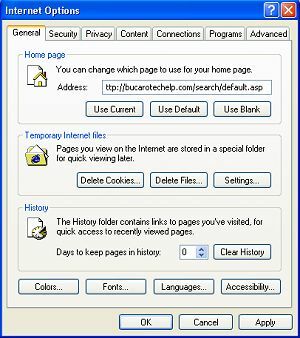 In the Internet Options dialog box, on the General tab, in the History section, set the "Days to keep pages in history" number to 0. Unfortunately, IE's definition of 0 days does not include today, so before you close IE, you still have to click the [Clear History] button in the Internet Options dialog box.